Mountain ecosystems, particularly in developing and underdeveloped regions, are experiencing rapid, unplanned, and unregulated urban growth. Recently, less accessible areas of the Himalaya region in India have begun to urbanize due to the extension of the road network, growth in tourism, and economic globalization. The sprawling urban growth in these fragile mountains and the resultant land use intensification have disrupted the hydrological systems of urban areas, and have consequently increased the susceptibility of anthropogenically-modified slopes to recurrent slope failures, landslides, and flash floods. Moreover, climate change has stressed urban ecosystems by increasing the frequency, severity, and intensity of extreme weather events. This article analyzes the impacts of rapid urbanization on the social and ecological systems of high mountain towns, and observes how this rapid urban growth is making them more susceptible to natural risks under the impact of changing climatic conditions. This underlines the need to understand the local geo-tectonic and geo-morphological conditions before allowing to expand the urbanization in fragile mountain terrain. It also suggests various measures for managing high mountain urbanization on a sustainable basis, and integrating adaptation strategies into urban management action-plan for fast growing mountain towns. The city of Nainital encompasses the area around picturesque Naini Lake in the Indian State of Uttarakhand, located in the Himalaya region (Figure 1). Combined with bracing climate and proximity to the densely populated plains of north India as well as being the administrative headquarters of The Nainital district in the Kumaon division of Uttarakhand, it is an important town in the region and one of the most popular tourist destinations. 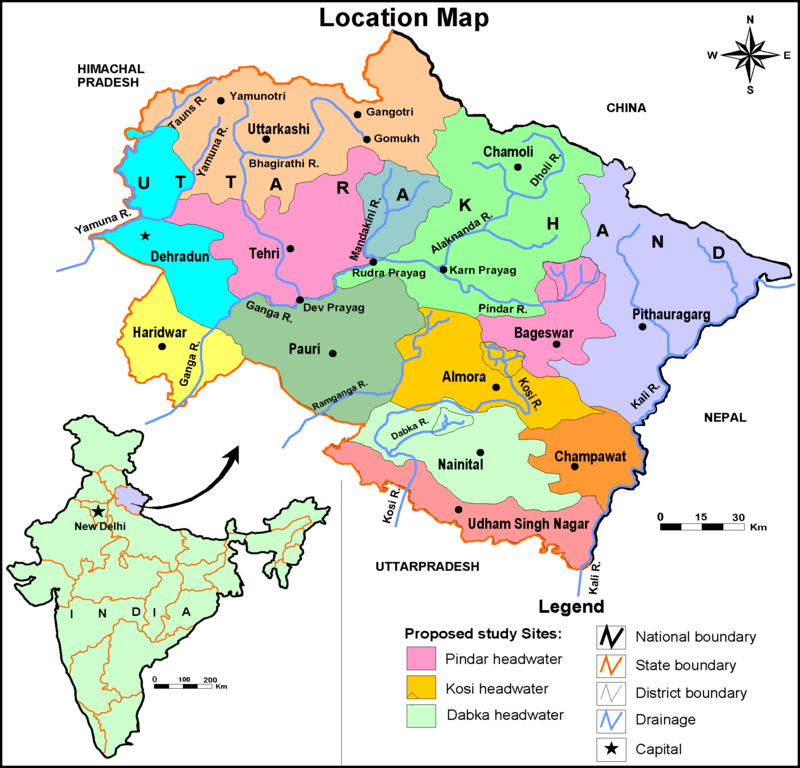 Figure 1: A map of Uttarakhand State in northern India. Image Credit: Authors. Nainital was founded in 1841, and grew into a town of 6,903 people by 1901 and to 49,900 by 2015. Before 1971, population growth was limited mainly to areas of lower altitude. After 1971, areas of higher elevation, steep slopes, and From 1981 to 2015, the population density of Naintal, which extends over a geographical area of 11.73 km2, increased from 2,111 to 4,177 persons/km2. In addition, the town also hosts a large floating population of approximately 150,000 people during the peak tourist season in the summer (Singh and Gopal, 2002). During the last four decades (1975 – 2015), rapid urbanization and a variety of other anthropogenic processes, such as construction of roads, parking areas, hotels and schools and development of recreational sites have increased the town’s susceptibility to landslides, rook falls, creeping2 and subsidence3 (Tiwari, 2014; Tiwari and Joshi, 2015; Valdiya, 1988). In 1930, the Municipal Council of Nainital laid down by-laws for regulating anthropogenic activities in fragile and geologically sensitive areas that were classified as prohibited from construction. The issue of environmental instability around Nainital has also been raised by various civil society groups and individuals in the Supreme Court of India and in High Court of the State of Uttarakhand. Both honorable courts advised against undertaking construction activities on vulnerable slopes around the lake. In spite of this, the built up area has increased even in the areas where construction is prohibited. In 1992, The Nainital Lake Region Special Area Development Authority (NLRSADA) which is responsible for issuing building permits, revised the building by-laws to further restrict construction activities in Nainital, and 1.64 km2 of the town was demarcated as unsafe for any construction. However, this area is under high pressure for further urban growth in the absence of an effective implementation policy. From 2005 to 2015, the built up space in these areas has increased by almost 50%, which is higher than average (34%) in the rest of the town during the same period. Despite its relative newness, Nainital has grown in a largely unplanned manner, leading to immense pressure on the limited urban infrastructure and services available to its residents. This has resulted in the degradation of urban environmental conditions and has increased the vulnerability of the population to the emerging threats of climate change. During recent decades, climate change driven fluctuations in precipitation patterns have been increasing as the incidences of high intensity rainfall and droughts are rising in the region, which pose serious threats to the ecologically fragile, tectonically active, and densely populated urban ecosystems. This uncertainty in precipitation patterns in Uttarakhand is illustrated by the fact that, during 2007-08 and 2008-09, the Uttarakhand faced severe drought conditions, with nine and ten districts respectively (out of total 13 districts) being drought affected. The entire mountainous part of Uttarakhand has been under prevailing dry conditions since August 2015. In contrast, between 2010 and 2013, the entire state witnessed excess monsoonal precipitation and massive losses were reported from across the state due to repeated floods, flash floods, and cloudburst events. Recent rainfall patterns have also increased the vulnerability of the town to various hydro-geological hazards, particularly landslides (Tiwari and Joshi, 2014). Nainital has experienced devastating landslides of variable magnitude ever since the evolution and development of town (Oldham, 1880; Auden, 1942, Nautiyal, 1949; Hukku et al., 1977; Pant and Kandpal, 1990; Sharma, 1996a and 1996b). More than 50% of the human settlements in Nainital are situated on landslide debris deposited over the years (Valdiya, 1988). The entire northwest portion of the town is developed over landslide debris that accumulated in past due to successive landslides. Disastrous landslide events that occurred in the years 1867, 1880, 1898, 1924 and 1998 caused massive devastation of urban infrastructure and loss of lives. The first recorded landslide event in Nainital was in the northeastern part of the town in 1866, which reactivated in 1869 and resulted into a massive loss of human life and structural damage to emerging settlements. However, the most disastrous landslide was on September 18, 1880, which originated from the snow view located in the Sher Ka Danda ridge in the northeast, following a continuous heavy rains of 84 cm in 36 hours. The slide debris washed away a number of settlements on down-slopes in the northern end of the lake, causing the death of more than 193 people. Naini Lake is not only a prime tourist attraction. It also constitutes the source of drinking water for the town (Singh and Gopal, 2002). However, due to rapid urban growth and major increases in construction activity, the rate of sedimentation has reduced the depth of the lake by 2.88 meters and decreased the water volume by 7,682.5m3 during the period between 1895 and 1979. A bathymetric analysis of Naini Lake has given a sediment accumulation rate of 67 m3/year between 1895 and 1967, and 78 m3/year during the period between 1967 and 1979 (Rawat, 2009). Climate change is likely to intensify the magnitude of anthropogenic stress on the lake and affect the availability and quality of water as both the residential and floating populations are increasing and the amount of annual rainfall is declining (Tiwari, 2014). Despite the recognition of these and other conditions, the government has yet to create a climate change adaptation plan for Nainital, nor has a detailed climate vulnerability and disaster risk assessment been carried out for any of the townships of Uttarakhand. A project for conservation of Nainital and other Lakes, jointly funded by Government of India and Government of Uttarakhand, is currently under implementation in the town. However, these and other urban development initiatives do not incorporate the impacts of climate change on urban ecosystem, nor do they include a mechanism for adaptation. A comprehensive climate change vulnerability assessment and mapping of the town should be carried out, taking into account all the critical parameters of exposure, sensitivity, and adaptive capacity of the urban ecosystem. A detailed and large-scale risk zone mapping of the town should be carried out, analyzing the parameters of geology, structure, lithology, geomorphology, demography, economy, and livelihood, infrastructure and services. A comprehensive urban land use policy should be developed and implemented, taking into account conservation, development, climate change adaptation, disaster risk reduction needs, and the priorities of the town. A participatory framework for the conservation of water resources, particularly through reducing anthropogenic intervention in the recharge zone of the Naini Lake and Sukha Tal, should be developed. An integrated climate change adaptation governance plan must be formulated, incorporating the above-mentioned points and involving a range of institutions and stakeholders (e.g., government line departments, private enterprises, civil society and non-governmental organizations, community based organizations and academic and research institutions). Nainital presents a representative illustration of the phenomenal urban growth that is taking places in the Himalayan Mountains of India, Pakistan, and Nepal, and also in mountain regions across the developing world. The situation presented and recommendations made in the present study could be translated to a large number of mountain and hill townships all across the Himalayan mountain ranges, and also in rapidly urbanizing Andean Mountains in Latin America. The town is situated in the close proximity of the Main Boundary Thrust (MBT) – a tectonic junction between the Middle Himalayan mountain in the north and outer Himalayan ranges in the south – and transverses by several other faults that makes the entire are highly fragile to the processes of mass movement and slope failure. The town experienced devastating landslides in the last two centuries. Creeping: Creep is a very slow mass movement that goes on for years or even centuries. One cannot see creep happening but leaning fences and poles and broken retaining walls show where it has taken place. Subsidence: Subsidence is mass movement-transport of large volumes of earth material primarily by gravity. It involves the settling or sinking of a body of rock or sediment, and may occur as the result of either natural or anthropogenic processes. Auden, J. B. (1942). Geological report on the hill side of Nainital. Unpublished report, Geological Survey of India, Kolkata. Hukku, B.M., Srivastava, A.K., & Jaitly, G.N. (1977). Measurement of Slope Movements in Nainital Area. Engineering Geology, 4, pp. 557-467. Nautiyal, S.P. (1949). A note on the stability of certain hill sides in and around Nainital, U.P. Unpublished report, Geological Survey of India. Kolkata. Oldham, R.D. (1880), Note on the Nainital Landslide 18th September 1880. Record of the Geological Survey of India, 13, pp. 277-281. Pant, G. & Kandpal, G.C. (1990). A Report on the Evaluation of Instability Along Balia Nala and Adjoining Areas, Nainital. Unpublished report, Geological Survey of India, Kolkata. Rawat, J. S. (2009). Saving Himalayan Rivers: developing spring sanctuaries in headwater regions. In B.L. Shah (ed. ), Natural resource conservation in Uttarakhand (pp. 41-69). Ankit Prakshan, Haldwani. Sharma, V.K. (1996b). Geological and Geomorphological Evaluation of Nainital Area with Special Reference to Stability of Slope and Urbanization. Record of the Geological Survey of India, 128, pp. 8. Dr. Prakash C. Tiwari is Professor of Geography at Kumaon University in Nainital, India. Dr. Bhagwati Joshi is Assistant Professor of Geography at the Government Post Graduate College in Rudrapur, India.